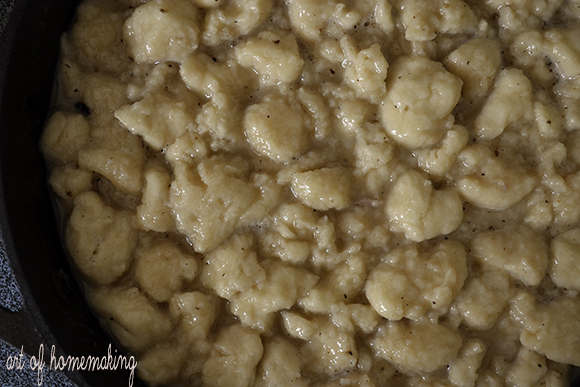 On any given Sunday in Appalachia a pot of Chicken and Dumplings will likely be simmering on the stove after church. And without a doubt, this mountain staple will be at every church gathering, family reunion, post-funeral meal and most likely a wedding reception in the hollers and hills. 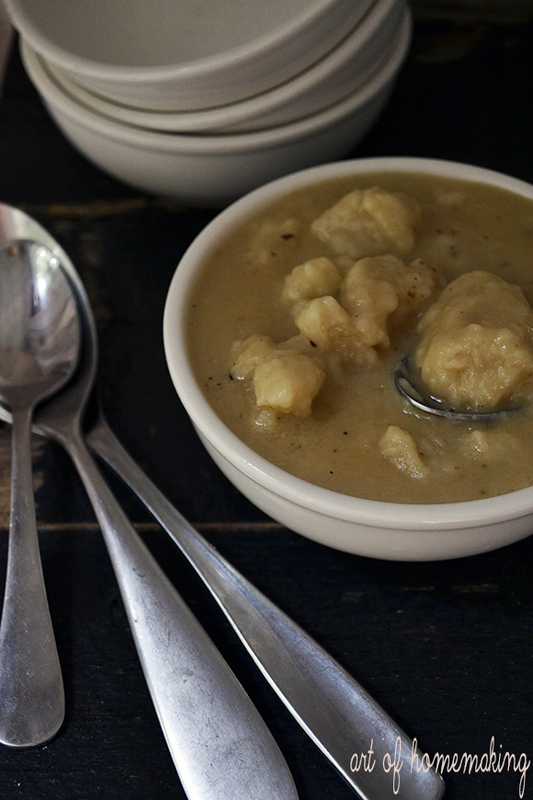 Today, when the boys came in from a long day at school, they walked came home to the smell of Chicken and Dumplings on the stove. This is ultimate comfort food for my boys. And on a day when I sent a magazine to print, made 100 biscuits, 4 pans of brownies and 100 Chocolate Chip cookies (no exaggeration), this meal was about the easiest thing I could conjure up on a whim. 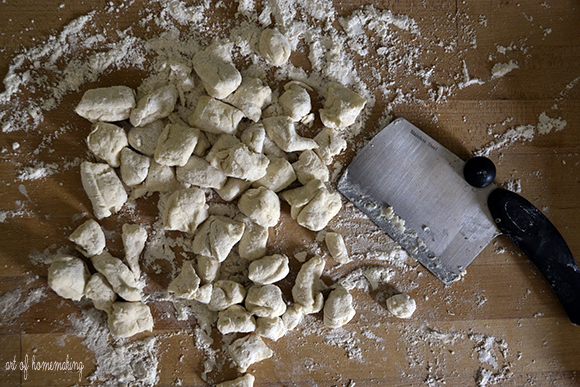 The components of Chicken and Dumplings are basic. Chicken stock, biscuit dough and...that's it. You could fancy it up with chunks of chicken, vegetables and herbs but at its most basic form you need nothing more than stock and biscuits. In Mongolia we had something similar made with a flour and water dumpling dough and a clear broth. Actually, I imagine every culture probably has their own version. I love to make homemade chicken stock. I've talked about it plenty of times here on the blog. Its a easy as saving your leftover rotisserie chicken bones, some vegetables like onion, carrot and celery and water. Simmer on the stove top or in a crock pot till golden in color and voila. Chicken stock. I have tried my hand at many-a-dumpling recipes over the years. Some call for cornmeal. That's not really a favorite of ours. Some recipes simply call for Bisquick. Again, we're not huge fans. I use this recipe and instead of forming shaped biscuits I cut the dough into small, ping pong ball sized chunks. You could even do this step ahead of time, rolling each dough piece in flour and putting them in a bowl in the fridge for a couple of hours. Once the stock is ready (you can always use store bought, of course) bring it to a rolling boil. The amount of stock you'll need just depends on the amount you think you'll eat. 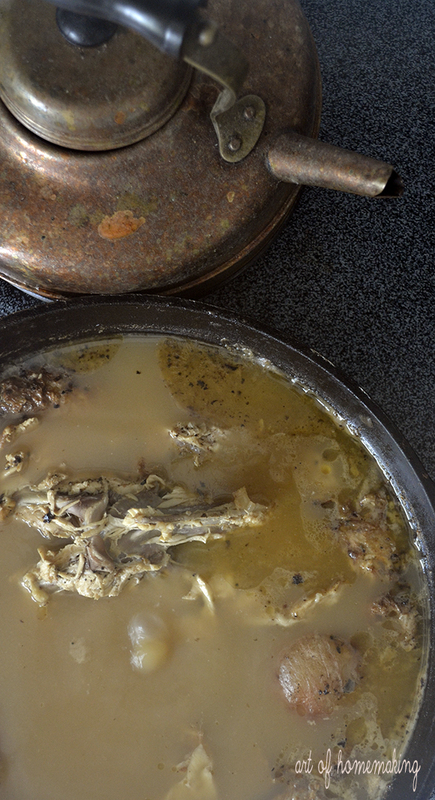 In the mountains you'll typically find a really, really, really big pot of chicken and dumplings boiling on the stove because inevitably, there will be company. Here at The Smith Homestead I keep it to around 6-8 cups of stock and 1/2 a batch of biscuit dough. That seems to feed 5 mouths just perfectly. 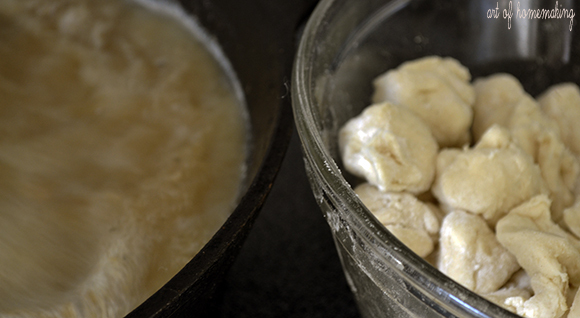 Once the stock is boiling, start dropping the small dough balls into the boiling liquid. Trust me, you may be tempted to cut corners and just start dropping heaping spoonfuls of dough into the stock. I wouldn't recommend. They grow exponentially in size as they cook and before you know it there will be no liquid remaining because these enormous baseballs have taken over the pot. Almost immediately they will begin puffing up and rising to the top. This is a good thing. Just keep dropping the dough balls in. They'll sink to the bottom and then rise when they're ready. Go ahead and crowd the dough balls in there. Its not like searing a piece of meat. No need to do this in batches. Once its all in the pot, cover it with a lid and continue to slowly boil (not rapid boil) the dumplings for 10 minutes. Taste. If they seem overly gluey, they probably aren't done. Keep cooking. The end texture of the dumpling should be soft. Not too chewy, not too gummy. Just perfectly dumpling like. 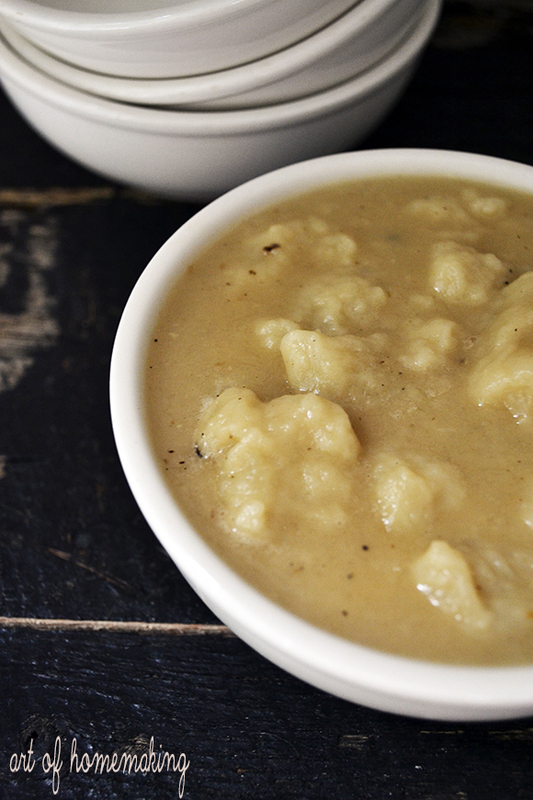 The broth will have thickened naturally, making the end result a really hearty liquid for the dumplings to swim in. Season with salt and pepper and ladle into bowls. Again, you could add shredded chicken, vegetables (it has a similar flavor to chicken pot pie filling so it makes sense) or fresh herbs like chopped parsley. Give it a go and tell me what you think~ I'm pretty sure it might become a staple in your fall comfort food repertoire too.